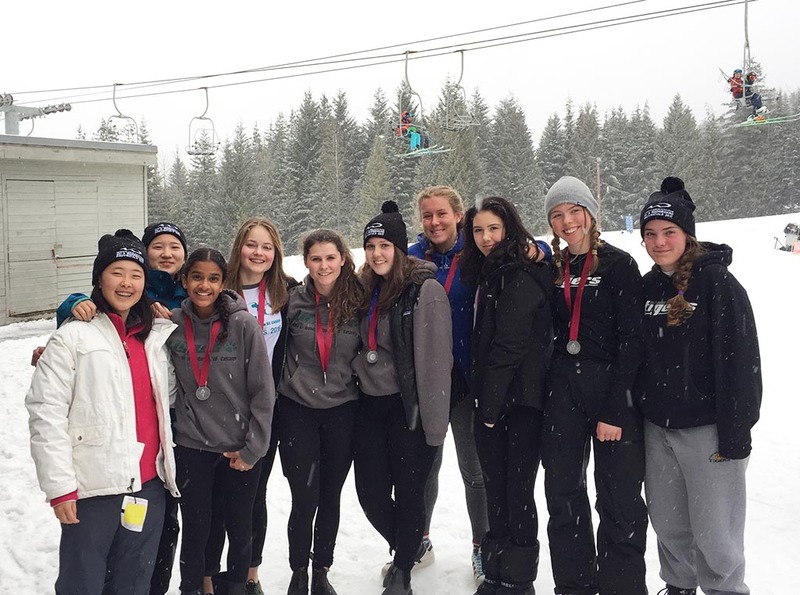 After intense competition at Whistler/Blackcomb last week (March 1-3), our Ski Team returned with silver medals at the Ski Provincial Championships. The school was represented by skiers Allison, Isabelle, Rebecca, Olivia, Catarina, Rosie, and Meg. The girls competed hard and despite less than stellar performances on day 1, they returned to form sweeping the podium in the TerrainGS on the final day, with Rosie finishing 1st, Meg finishing 2nd, Rebecca finishing 3rd and Olivia rounding out the top 10. Overall, Meg finished 3rd and Rosie finished 9th in the province. Despite this outstanding accomplishment, YHS was two points shy of Collingwood in our bid to bring home another provincial championships banner. Our three snowboarders also raced well and had some personal bests, including personal bests for Selina and Cici, and a great 13 place overall finish by Grade 8 rookie Natasha. Congrats to all the girls for an excellent result and a huge congrats to all the girls that were part of the team this year. Special thanks to Grade 12s Brianna and Jenna for coming out to support the girls. On February 8, a long day on the hill and some challenging timing issues, the Ski Team came home with their 11th straight Zone Championship. The team was led by Meg, Gr. 11, Rosie, Gr. 10, Catarina, Gr. 10, and Olivia, Gr. 10 (who ended up being our top 4 scorers), but any of our top 13 racers would have helped the team win and qualify! Our snowboarders all placed in the top four with Natasha, Gr. 8, finishing as Zone Champ in a tightly contested race for first place overall. Thank you to coach Mr. Ruse, and to Mr. Dallman, Mr. Lum, and Ms. Matthews, for their help with the team this year. The Senior Tigers season ended at the AA Lower Mainlands. They started the tournament with a terrific win over Collingwood. Our three graduating senior students were recognized and we had a great turn out of alumnae, parents, past parents, and staff. The Tigers then lost to Britannia and then to STMC to be eliminated. The girls got off to a slow start and fell behind early but battled hard to the end but STMC was too big and too quick. Our young team had a solid season and exceeded many expectations. Coach/alumnae, Erin Allan ‘02, and her assistants, Ben Dove and Kelsey Blair, have done a tremendous job this year leading our young team. Our Senior Team also competed in the VGBA Tournament hosted by Langara College. They lost a tough opening round game to Churchill, but they easily defeated Magee and John Oliver to place 5th overall. 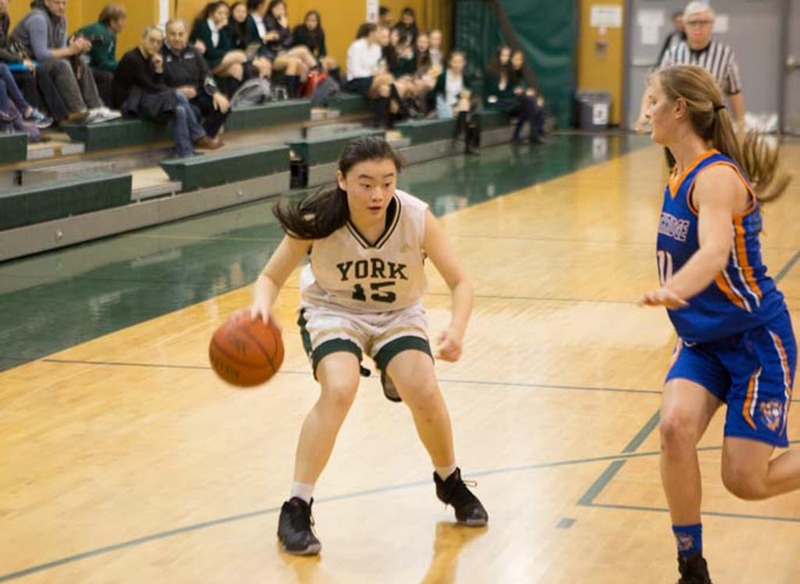 The Junior Basketball season wrapped up with the LMISSGBA playoffs. The Junior Tigers also finished 3rd at the ISAs defeating Southridge by 1 point for the Bronze. The Junior Tigers have been led by long time parent coach Norm Roberts with help from Alums Gina O’Neil ‘15, Danielle Tognetti ‘13, and YHS teacher, Mr. Peterson. Our Junior Team also competed in the VGBA Tournament hosted by Langara College. The team struggled as some key players were missing due to VMUN (Vancouver Model United Nations), but the remainder of the team demonstrated commitment and courage by competing hard each game. Our Grade 8 Basketball Team’s season ended at ISA’s. They placed 7th after a tough loss to SMUS and to CHS, but won their final game. Thank you to coaches, Ms. Nagengast, and Ms. Race for a great season! York House hosted another successful 26th St. Tournament, for the 19th year in a row (Feb 2-4). Ten of BC’s top teams came to YHS to compete for the Big Kahuna Cup. Teams came from Prince Rupert, Kelowna, Chilliwack, and from all over the Lower Mainland. The Tigers placed 7th with a win over AA#11 ranked Southridge Storm in the opening game. While not ranked in BC, the Tigers have shown that they can compete and beat those teams in BC ranked 10 – 20. North Shore powerhouse Seycove Seyhawks went on to win the 2017 Big Kahuna Cup and this past week in Langley, won their first AA BC Championship. We have three students, Laura, Isabelle, and Cindy, who took part in the 2017 Secondary School Table Tennis Championships at Britannia Secondary School. Isabelle is nationally ranked and took the gold medal in individual play while Laura took the bronze. As a team, YHS finished 2nd overall.